Diagnosis and Treatment of Children and Adolescents: A Guide for Mental Health Professionals is a resource tailored to the particular needs of current and future counselors, behavioral healthcare clinicians, and other helping professionals working with this vulnerable population. 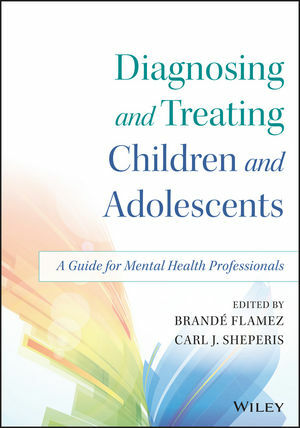 With in-depth content broken into two sections, this book first provides a foundation in the diagnostic process by covering the underlying principles of diagnosis and treatment planning, and then applies this framework to the DSM-5 categories related to children and adolescents. With research continually reshaping our understanding of mental health, it is critical mental health professionals make decisions based on evidence-based pathways that include the specialized research around children and adolescents. The leading experts who contributed to this book share contemporary perspectives on developmental considerations, assessment information, presenting symptoms, comorbidity, levels of severity, prevalence data, and other relevant factors. Diagnosis and Treatment of Children and Adolescents: A Guide for Clinical and School Settings is a critical resource for mental health practitioners and graduate students working toward a career in a mental health profession. BRANDÉ FLAMEZ, PHD, NCC, LPC is a licensed professional counselor and clinical professor in the Counseling and Special Populations department at Lamar University. She is also the CEO and Founder of the nonprofit Serving and Learning Together (SALT) world Inc., which provides volunteer services to developing countries. CARL J. SHEPERIS, PHD, NCC, ACS, LMHC, LPC serves as Chair of the Department of Counseling and Special Populations at Lamar University. He is a Past-President of the Association for Assessment and Research in Counseling, Associate Editor for Quantitative Research for the Journal of Counseling and Development, and a Director for the National Board for Certified Counselors.